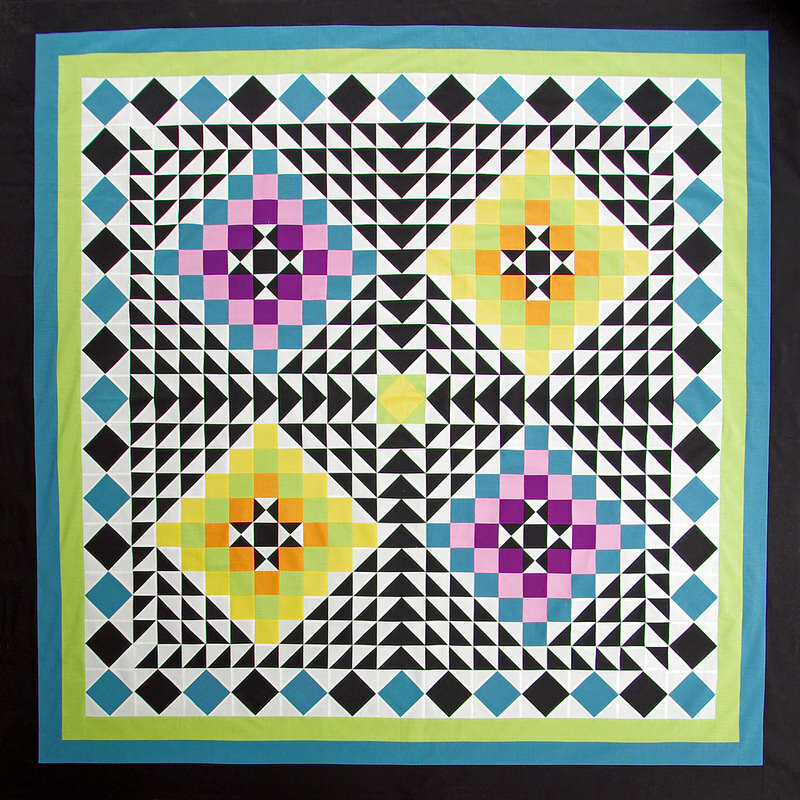 Do you have a bucket list of quilts you would like to make? I do. And it is quite a lengthy list of quilts, most of which are intricate and time consuming to make ... all waiting for my creative mood and timing to be just right. It seems this week was the right time to tick just one such quilt off my list. 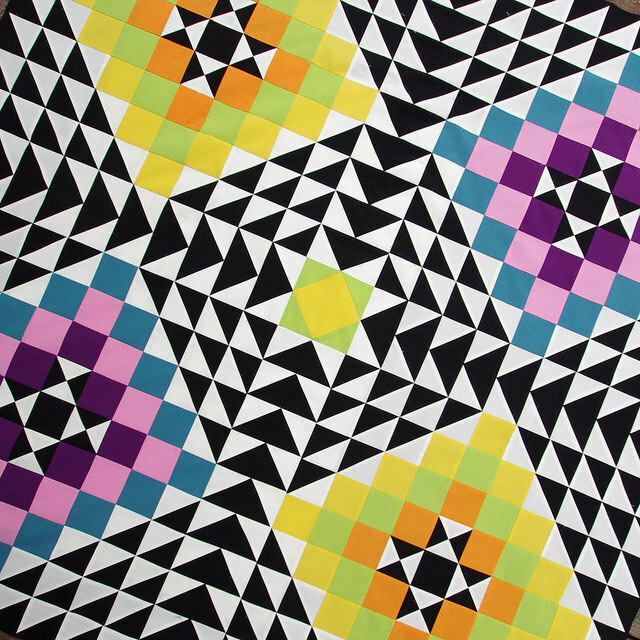 This quilt is inspired by the Kaleidoscope Quilt from Urban Outfitter. I have made a few changes, some of which were unintentional (see the direction of the flying geese units), I have omitted one of the borders (as I was working to a specific quilt size) and worked out my own math. 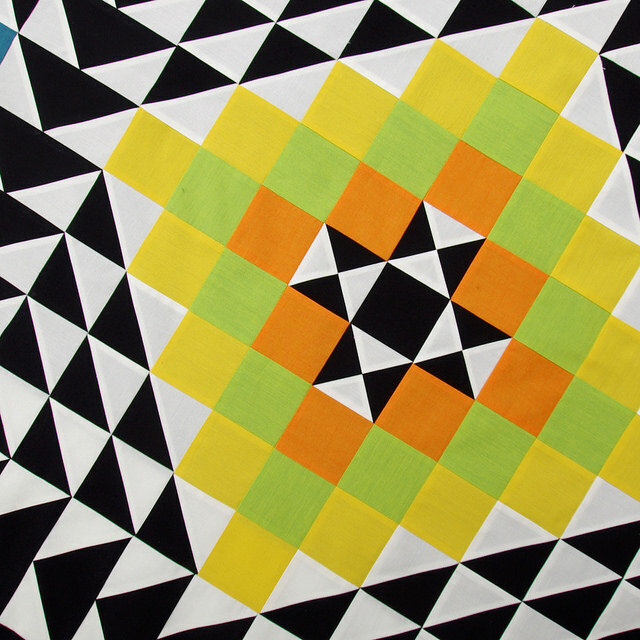 This quilt is based on several very basic traditional patchwork units (like half square triangles, hour glass blocks and flying geese units) and traditional layouts (like trip around the world and shadow star blocks), which makes re-construction simple. 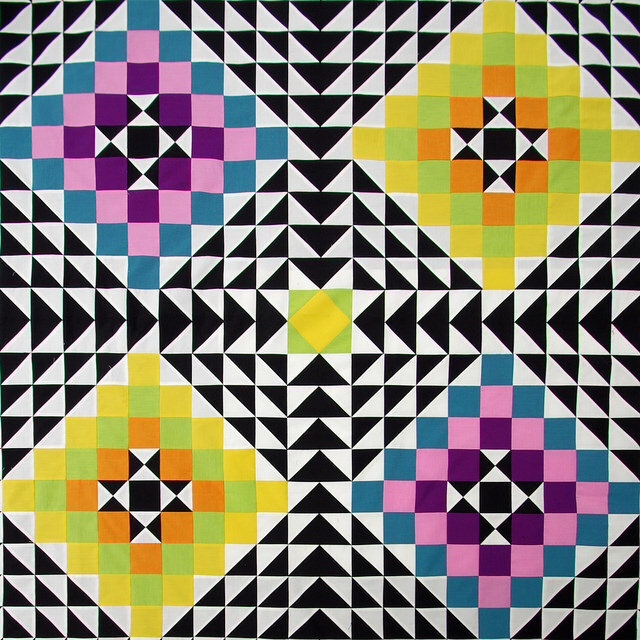 Making your own Kaleidoscope Quilt is fun and has provided me with many hours of creative pleasure, but it certainly is not the most cost effective. Materials used for my quilt top alone well exceed the retail price of the Urban Outfitter Quilt. 3 borders each 3 inches wide. 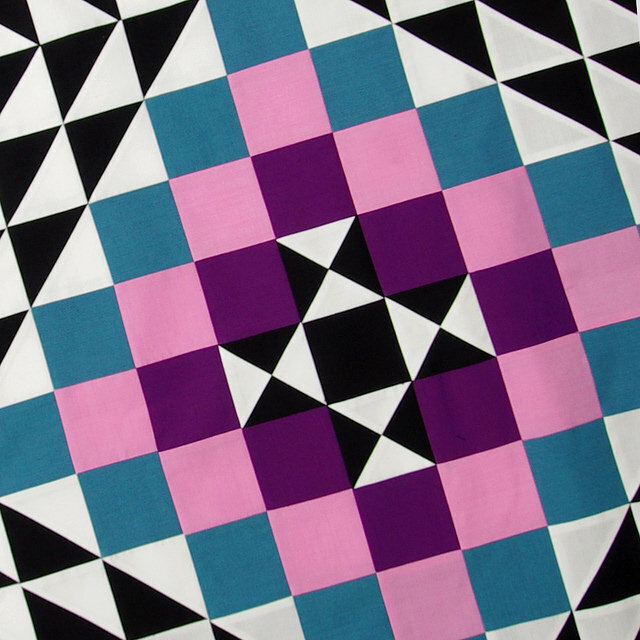 Whilst this quilt is not hard to make - time consuming but not difficult - it does require accurate cutting and piecing. I over-sized all of the half square triangle units (pressing open the diagonal seam) and then trimmed each unit to size. I did the same for the flying geese units; oversizing then using a Flying Geese Bloc-Loc Ruler to trim to size. This is my preferred method of patchwork piecing (as always, I recommend you use whatever method works best for you). Beautiful Oakshott fabrics! It is difficult to capture in a photo just how lovely the weave of these fabrics are. Oakshott Colourshott fabric has a shot weave with a warp and weft of different tones - which creates a beautiful luminous and iridescent hue. This quilt is not for sale. It has been made as a commission for a raffle quilt. I am working on this project in collaboration with Karen Terrens (long arm professional quilter, who also happens to be my sister). Karen will be quilting this quilt. It is going to be amazing! I am really looking forward to seeing how the quilting adds texture and interest to this quilt. I will be sure to share with you the finished quilt when it returns from the quilter. LOVE this quilt! Spectacular as always. Please show us the finished quilt when it comes back to you. This quilt is just spectacular!! Stunning work - I can't wait to quilt it. What an amazing quilt! So much patient work has gone into it. I think making the units too big and trimming them down is an efficient way to get accuracy. And accurate points certainly give this quilt a real 'wow' quality. I'm looking forward to seeing it quilted! This is absolutely beautiful! Looking forward to seeing the finished quilt! I had no idea Karen is your sister! I'm sure the quilting will be amazing! Rita! You have outdone yourself. I almost gasped when my browser opened your page. This quilt is amazing. You amaze me!! Your piecing is so precise. I cannot wait to see it quilted. And I look forward to seeing the other projects on your bucket list. All my bucket list quilts are slow and fiddly, with lots of small pieces, a bit like this one. I have ticked a double wedding ring off the list and have almost done the top of a Dear Jane. Nothing can frighten me now! It is just a matter of finding the time to make everything we want to, right? Have fun planning how to quilt this! Wonderful quilt. Is there a tutorial on how to over- size d your units. I knew as soon as I saw the sneak peek on IG that this was inspired by a quilt at Urban Outfitters. It is absolutely stunning! I see myself working on one of these beauties sooner than later. Thank you for being a constant source of inspiration! You continually amaze me. Your work is always so precise and colors are so perfect. This quilt is wonderful. I so love coming to your website to browse. Can't wait to see this quilted. This is such a fab quilt! looks like a painting ~ amazing! Love it. My bucket list is getting so full I may need a barrel. Again you stun us! Please say you have worked on this more than a week. Also again I would love to know who does your photos and how the wonderful images are created. Hi Ellie - I did work on this quilt top for most of the week, it certainly wasn't a quick project. I worked on it in stages, starting first with making all the Flying Geese units, then all the black/white half square triangles. I take and edited all my own photos - I use a Pentax camera. I don't have any lighting equipment so all photos are taken outside. I then edit the images using photoshop. Taking photos isn't one of my favorite tasks! I am anxiously awaiting your book! I know you could fill one with some dazzling quilts! This will be a wonderful finish! Even in this perfection, I can imagine multiple other color schemes that may have to go on a bucket list of my own! You are the queen of HST!! I love the use of solids. 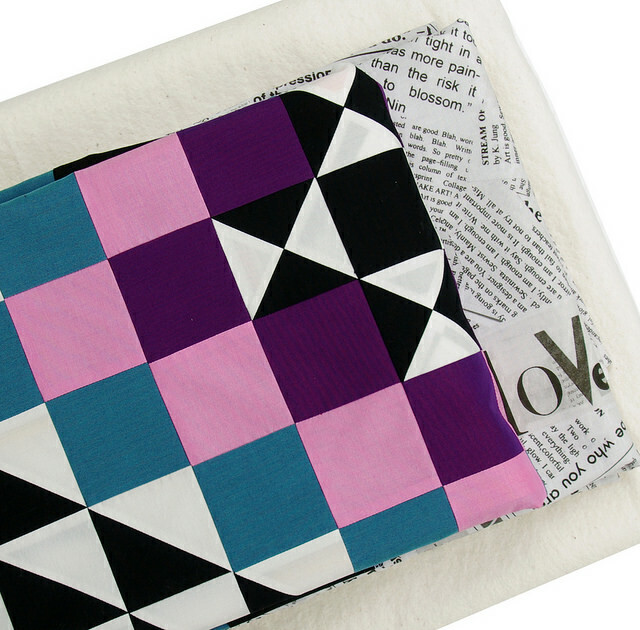 Gone are the days when solids were used in Amish quilts only. 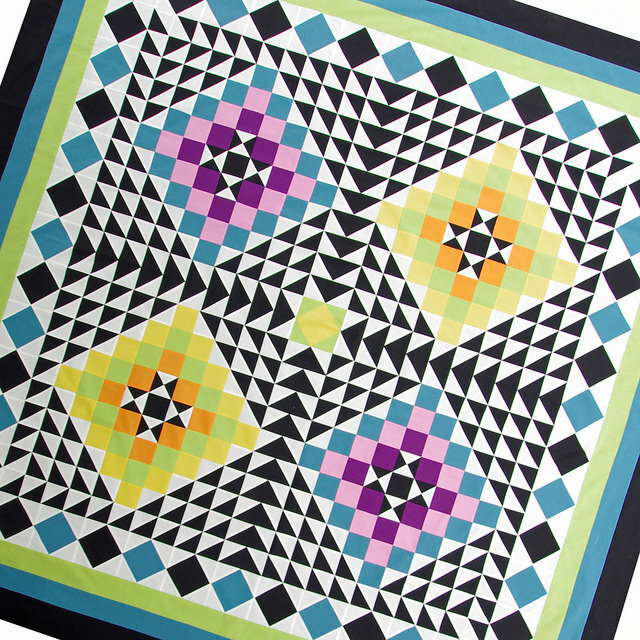 Hurray for solids and the quilts that make them shine. Your commitment to detail is as inspiring as ever, Rita. I've all but lost my desire to piece quilts requiring this level of accuracy, so I admire this even more. Gorgeous colour choices, too. I am sure it will be a massive success in the raffle! So crisp and clean looking--and I love Oakshott cottons, too! Love this! It has an cool illusion to it. I do have a bucket list in my head. I just know certain quilts I want to make just to see if I can and then there are those I dream about to create on my own. I don't see it all happening any time soon but I can dream. 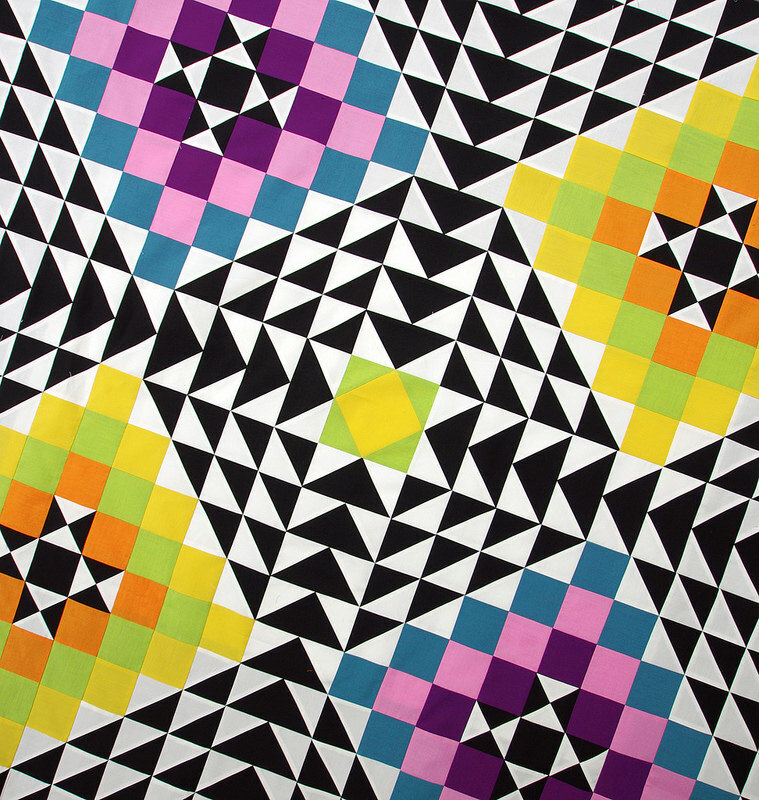 This quilt is "da bomb." Rita, you continue to amaze. With Oakshott cottons do you have to be mindful of the direction of the fabric? Hi Kathaleeny - I wasn't overly mindful of the direction of the fabric and cut pieces no different to how I would cut pieces from any other fabric. The fabric does fray a little and I was mindful of that when pressing seams. You made fantastic use of those gorgeous Oakshott fabrics! Rita, you and Karen are going to raise a lot of mula for the raffle! This is jaw-droppingly gorgeous and amazing! I was going to ask how you were going to quilt it until I read that your sister will be. Can't wait to see it when it is completed! This piece is sure to bring in lots of sales for the raffle! I am in awe! This quilt looks fabulous and I love Oakshott cottons a great choice of fabric. I was wondering if it was purely oakshott or mixed so thanks for the rundown of details. It is stunning. Thank you for your comment ~ I have used only Oakshott Colourshott fabric for this quilt.